The first game of the new year to be held in the man cave will be based on the Memoir '44, Richard Borg penned large scale scenario depicting Operation Market Garden. The set up will be as per the scenario map but I shall be using Bob Cordery's Memoir of Modern Battle rules with the rather neat solo option of rolling the dice to determine which units you can order. The low numbers reflect the chaotic condition of the German defenders and for the Airborne units the value of superior training and the element of surprise. Should an Airborne formation lose a complete unit then the number of combat dice drops by one for each unit down to a minimum of 4 dice. The corresponding Germans then add an additional dice, up to a maximum of six. I have borrowed the victory conditions for the scenario from the scenario itself (13 medals granting victory) and also a couple of the special rules - special forces for the Paratroops, inflatable boats for the 82nd and special road movement rules. I plan to run this tomorrow (Friday) and of course the after action report will follow on the blog in due course. The early war version of the famous T34 tank that came as a bit of a surprise to the invading Germans! The early war Russian force I am building up for operations against the Turks and the Germans in the Caucasus will of course feature some examples of the above tank. Armourfast produce both the early war version and the 1943 variant with a modified turret. I shall pick up some of these at Skirmish in a couple of weeks (17/03) but would ideally like to lay my hands on some Pegasus Hobbies BT7 kits as I would prefer to use these as the main Russian tank - on balance they would be a better match up for the other early war kit I shall be using. Still, one has to make the most of what is available so better a T34 in the hand than a BT7 in the warehouse! Mention of which has made me realise that whilst having acquired a box of really nice Plastic Soldier Company T70 light tanks this may have been in error as they are a little later than I would ideally like as they not come into action until the second quarter of 1942. I will need to give this some thought although I like the idea of Russian light tanks alongside the T34s though so will probably stick with the same. I will be taking some historical liberties (no more than having Turkey as a combatant nation in the first place though!) with the Turkish armour in that I intend giving them some Czech 38t tanks. Historically they received some Pzr 3s from the Germans but I rather like the idea of the Turks using the Czech tank. Turkey actually acquired by purchase a number of Czech transport vehicles including some fully tracked lorries so throwing in the tanks as well is probably not such an unlikely event. For no other reason than that I like the idea of it the Russian forces will be relatively light on the armour side - not so much in terms of the number of vehicles I intend acquiring but more that the tanks will be lighter than you ordinarily expect to see. No KV1s or earlier heavy tanks then - just T34s, T70s and perhaps some BT7s. The armoured contingent is designed to be mobile and far reaching (not that the logistics are able to keep up in any event!) - a rapier rather than a broadsword. The Painting Part is the twelve WW1 light cruisers I currently have under the brush for the various 1:2400th fleets I plan to raise. At the moment the models have been under coated, based and the decks have been painted. I am using Humbrol enamels and a white under coat but will be using acrylics for the card base. I have a very nice tube of a shade of blue that is a very close match to the colour of a Hexon tile and whilst this is fine for the Aegean it is a little too blue for the North Atlantic. I am not about to paint Hexon tiles to suit the region of the planet I am gaming so the Azure Blue will have to do (rather poetic that last bit, I thought). The Waiting Part concerns the Stonewall order which should be with me this week at some point and so the great paint fest can begin in earnest. I am still a little light on early battle cruisers for the fleets though - in fact I do not have any! The next show for me will be Skirmish on 17/03 at Sidcup Grammar school - this is a great little plastic soldier show and I hope to be able to pick up a few more of the kits and figures I need to kick off the Middle Eastern project. You may be forgiven for thinking that both of the above - Stonewall and Sidcup - refer to the planning part of this blog post's title but this is not the case. The Planning Part in fact refers to the first game I shall be running in the newly reorganised man cave - in fact the first game I have run this year (and it is nearly March!). Originally I had intended to run a small naval action in order to give my version of Bob Cordery's Portable Naval Wargame a run out but now have something a little more expansive in mind. I am looking at tackling one of the Memoir '44 Overlord sized scenarios but using either Bob's Big Battle Portable Wargame Rules or his Memoir of Battle set (or I could be really off the wall and just use the game rules as they are but with something else in place for the command cards element) with the Memoir '44 kit. I have all of the scenario packs in my collection (I want to get the Breakthrough boards and the equipment pack at some point; together with volume 2 of the campaign book and the Winter Wars pack) and so I am currently looking at either Operation Market Garden or possibly the Tobruk scenario. I also have something else in mind for a small project but that will have to stay under wraps for a while. ....and the above is a commemorative postcard issued to celebrate the fact! The 'Town' to which I am referring is of course the 21 ship class of Town class light cruisers built just before the outbreak of the First World War. The Stonewall Figures range incorporates two of the sub groups being the Bristols and the Chathams. I have four of each and intend splitting them between the Royal Navy and the Fezians for the WW1 era. Thus far I have all eight cleaned up and fixed to their card bases awaiting some paint which will be this evenings task. A potted overview of this class, which saw much action during the First World War can be found here - Town Class Cruiser. The models are very nice and the detail is very well rendered. There was a little cleaning up to do but nothing major and seeing them for the first time on a base 3" long by 1" wide fully justified my decision to opt for 1/2400th - they look suitably imposing on the table top in a way that similar vessels in 1/3000th do not. I also have a batch of four German light cruisers of the Magdeburg class - the most famous of which was of course the Breslau which accompanied the battle cruiser Goeben into Turkish service in 1914. The name ship of the class - the Magdeburg - had the dubious distinction of providing the Royal Navy with a code book when she ran aground and was seized by the Russians off the Estonian coast. Again, a potted overview of the class can be found here - Magdeburg Class Cruiser. Again, this is a lovely model and the twelve 4.1" guns are very clearly defined - in fact the twin gun positions fore and aft even have the barrels with a clear undercut and although they are hugely too fat still look very effective indeed. I am hoping to have these finished in a couple of days - to be honest they are not too taxing, even for me - and all being well the order from Stonewall would have landed in the interim and so the serious work on this little lot can at last commence. HMS Mars in 1/1250th scale - you have got to love that Victorian paint job! The 1/2400 pre-dreadnought era models will be painted in WW1 grey finish - simply because I have a pile of larger models in 1/1800th (courtesy of Dave Ryan) for the period that will look far nicer in the earlier livery. A selection of welcome retail therapy - there is some more! Firstly, apologies for the late post - I started typing this up yesterday but the day just seemed to disappear! For us folk 'down south', Cavalier at Tonbridge is the first wargames of the year and is a welcome way to banish the winter blues. This was the first time I had been to this show at its new venue and was pleasantly surprised by the relatively easy journey I had to get there. Bob and I had some trading to deal with and so I now have sufficient 20mm Gernan and Russian WW2 infantry to really kick start my Middle Eastern project - and probably explains the main bulk of my shopping list as seen above. Two boxes of Plastic Soldier Company Pzr 3s, a box of Pzr 4s, a box of the new PAK 38 50mm AT guns and a box of Russian T70s and a rounded off with a couple of boxes of Hat Renault FT17s armed with the 37mm gun. Some other bits and pieces were acquired - some of which will remain under wraps for the time being. I also spoke to Dave Ryan of Caliver Books - Minifigs Ships fame and was delighted to receive a box full of Minifigs warships which will be more than sufficient to tackle the Rusland and Fezian navies in proper pre dreadnought plumage in due course - that means that the 1:2400th models can instead be painted grey to fit in with the WW1 ships due to arrive next week. Many thanks Dave, much appreciated. My stop at the Plastic Soldier Company stall coincided by the visit of Henry Hyde of Battlegames fame - I was amused that he rather drily observed that 20mm was 'the one true scale' just as I picked up my boxes of German armour....;-) This gave me a warm, fuzzy feeling of righteousness, almost like that of a crusading zealot! I must confess that whilst I took my camera I did not take a single picture the entire time I was there and not only that, I also did not really spend much time looking at the games put on aside from SEEMS Very French Civil War run using Bolt Action (and my time there was certainly brief enough!). Cavalier Ticket number 001 - I was the first person to but a ticket on the door - a notable first in my opinion! It was a great day out and to be honest I was just happy enough being immersed in matters gaming related and spending time among fellow enthusiasts (and spending some money of course!). The only downside was a rather unpleasant incident in the Bring and Buy which I only found out about this morning. Best read the following link for details - Don't Throw a One! I hope the perpetrator of this crime (because that is exactly what it is!) is caught, named and shamed because quite frankly, stealing (in any form) from a fellow enthusiast is certainly way beyond the pale. You see above a picture of my latest acquisition. The V-1 and its rather short launching rail is used as an objective in the latest starter set for Flames of War called Open Fire. My plan for this model (and any others I can get a hold of - ideally I would like 3 of them) is to use them for some Angels 20 anti flying bomb games down the club. The model is rather basic and will merely need tidying up a little, painting and mounting on a flying base to be ready to use. Mention of Angels 20 brings me round to the planned repaint into Fezian colours of my BF109 Es. These will now be painted in tropical Luftwaffe colours and will form the air support for the Deutsch Asia Korps - the German forces earmarked to support the faltering Turkish invasion of the British Middle Eastern protectorate. The Turks will have to make do with MS 406s to start with. The only problem I have at the moment is the air support for the British. I would really like to be using Gladiators but aside from Old Glory producing a resin version I am not sure you can get one in 15mm. My plan then, is to make use of some Hurricanes and possibly some Brewster Buffaloes. Both Mr.Fox and I are hoping that the new starter set and the accompanying booster packs are available at Cavalier in Tonbridge on Sunday. As ever, reports on the new toys will feature on the blog in due course. I have made a start on the 1:2400th WW1 ships from Stonewall - the main order is being sent out tomorrow so Mark informed me - as I want to road test my naval rules sooner rather than later and of course, this will also feature on the blog. The first batch of models are light cruisers and some destroyers although I am very tempted to tackle the assorted pre-dreadnought era models I have that will be doubling up in the fleets of both Rusland and Fezia. The decision I have to make with these particular models though is whether or not to paint them in their pre-dreadnought plumage or go for the simpler overall grey. I am having a 'heart versus head' dilemma over this although suspect that the head will prevail (much to the disgust of the heart no doubt!). The clincher for this is the fact that the earlier ships will be fighting with WW1 era models as well. Cavalier at Tonbridge on Sunday I am really looking forward to - it is the first time I have been to the show at the new venue - as it will give me a chance to blow off the seasonal cobwebs, meet up with friends old and new, see some inspiring games and to indulge in some selective retail therapy. I have a modest war chest amassed and I am not afraid to use it so traders beware! The plans to renovate the man cave are now complete and so I can sit down and really scope out the various projects I have in mind for this year. I want this year to the year of using painted models rather than solely relying on the block armies - and that also includes the Command and Colours Ancients and Napoleonics. My problem is, and in fact always has been, I am a very s-l-o-w figure painter. I usually manage to run out of enthusiasm for a given project long before it is anywhere near to completion so if I have learned anything over the years it is that I have to be sure that what I am tackling is going to be finished. This means small, bite sized chunks of projects - DBA sized forces in fact - which is why the whole Portable Wargame/Command and Colours system sits so well with me. The first priority will be to tackle the ships just as soon as the Stonewall order arrives. I will also be picking up some extra models for this project at Tonbridge so will have absolutely no excuse for not kicking this off as soon as possible. Painting WW1 warships is easy enough, even for me, and this will be a nice easy introduction back into brushwork. I have a set of rules to use with these models and it will probably come as no surprise that they are my own version of Bob Cordery's Portable Naval Wargame. They are simple, effective and with the all important 'feel' factor. I would love to tackle something late 19th century as well but this is a way off yet. I also have plans for something a little out of the ordinary that will only involve me painting around 50 figures in total and I hope to unveil this once it is complete. All in all then, I have a number of things to keep me occupied during the coming year although I daresay that something else will come along to distract me - it usually does! Phew! After a day spent unloading units, taking units apart, put units back together in different places and then reloading them (and realising that certain items from the collection fitted better in other locations) I have finally finished the revamped man cave! The main changes are that I have now have all the bulky stuff at the end of the loft and the slimmer stuff - the book collection - is now along the sides. This has given me extra floor space and the big advantage of this is that I can now deploy a 6ft by 4ft playing area with room to walk around it should I choose. I usually use a 5ft by 3ft table as this fits a 13 x 9 Hexon (aka the standard Command and Colours playing area) very tidily. Now this is done I can finally concentrate on getting some games in and also, more importantly, I can focus on the painting and modelling required for the various projects I have in mind. Ships first though - once my Stonewall Order arrives! I have been giving a lot of additional thought to the proposed 'Turkey-joins-the-Axis-in-WW2' idea and the plans are slowly beginning to take shape. The basic premise is that Turkey have joined the Axis following the fall of France on the understanding (at least from the German standpoint) that they will be engaging the Russians in the Caucasus when Operation Barbarossa is launched. To this end the Germans will supply advisors and some material by way of support. Privately the German see the Turks as a triumph of quantity over quality and so their role will be relatively limited in scope - really just a strategic diversion to draw Russian forces away from the main German thrust. The Turks though, have their own ideas about what they will or will not be doing. The main Turkish aim is liberate from French and British 'Colonialism' those areas of the Middle East lost at the end of the Great War. These include Iraq, Syria, Lebanon, Palestine and vast tracts of the Arabian Peninsula. They are of course well aware that the price of a German alliance means war with Russia but the Turks have already deduced that their role is very much a subsidiary and diversionary one. They will be happy to face off against the Russians but the main focus will be the 'liberation' of the Middle East. This is all well and good on paper and in the various Turkish Army HQs but in reality the armed forces are ill-equipped to fight an aggressive war of liberation. Their army has not evolved much from the Great War although mechanisation is much in evidence it has been a very slow and uncertain process. The air force is relatively large but is outdated with few modern types and the navy is suitable for coast defence work only. No doubt the humble Turkish infantryman will be his usual doughty self but up against a modern force may well be sorely tested. Luckily for them, the armed forces of their intended victims are in even worse shape, at least in respect of numbers. The plan is for the Turks, rather like the Italians, to get themselves into difficulties which the Germans, for political reasons, having to provide more direct support than they would have otherwise preferred. The British have a modest force available but would be expected to draw on the Indian army for reinforcements if required. This includes artillery and tanks with a small air element. The French have the Foreign Legion and various supporting units BUT will be initially under Vichy control. Again, tanks and aircraft are available. Having said that, the French are not expected to be active participants in any action against the British but the possibility certainly exists - they are satisfied with the area they have 'under control'. Both the British and French will also have access to locally raised units and of course, they also have the problem of dealing with nationalists within their respective areas. The equipment available to both of these armies tends to be second rate but perfectly adequate for use against insurgents armed solely with infantry small arms. Anti tank guns will be early war types - 37mm, 2 pdr and 45mms. Artillery will be towed and of field calibre. Plenty of ideas then for what I want to use and luckily there is much available that can be acquired easily enough so here's to a great shopping trip at Tonbridge! You know how it is. You sit down and decide that certain items from your collection are no longer required, or that the space you fill with your 'stuff' could use a little reorganisation, even that you want to 'rationalise' your interests and then before you know it, you have a full scale overhaul on your hands. So it was with me. The idea started out as a modest change around in the man cave - simply moving the shallow units to the long sides of the room so that the deeper units could all be along one end. I should point out that my loft is longer than it is wide and so having deeper units along one of the short end walls takes up less usable floor space than having them sticking out along the long sides. So far, so good, you could be forgiven for thinking. The plan entailed using the narrower storage units (narrower as in 30cm deep shelving as opposed to the 50cm deeper shelves) as bookcases which in turn meant that I needed to get some additional bits and pieces from Ikea. Again, no problem. Whilst planning all this moving and shaking I was mentally redeploying my book collection and that is where the massacre part of my tale comes into its own. I realised that I have a lot of books. Not as many as some I don't doubt but a pretty reasonable collection all the same. Therein lay the problem. I found myself looking at books that I had acquired and in many cases never read - all with the best of intentions of wargaming whatever period the title in question covered. In a nutshell, this was frankly ridiculous! I suddenly realised that what on earth was the point of me buying books for periods of history that I would never get around to gaming? I have enough trouble managing the periods that I am likely to be gaming let alone those that 'seemed like a good idea at the time'! Something had to give and so with the ruthlessness that I usually make my best (and worst) decisions I am having a HUGE clear out. Gone will be the Armada period, the 17th and 18th centuries (ECW, French and Indian and AWI), Napoleonic Peninsula, Pirates (lots of pirate titles! ), ACW on land - I shall be keeping the river based titles - and some colonial titles, some WW1 and WW2. Much of this has been acquired via boot sales or from remaindered bookshops so the original cash outlay was fairly modest - certainly nowhere near the cover prices for sure. I have done this in the past but not on the scale I am about to undertake. I can focus my efforts on fewer periods - which will mean I will have a fighting chance of seeing them through to completion! I will gain a warm and fuzzy feeling of inner peace and calm....(until the next time of course....). The plan is to build up a war chest for use at Tonbridge on the 24th so the sacrifice of the many will fulfil the needs of the few - actually of the one but you know what I mean! Now I have to admit that this is a facet of WW2 about which I know absolutely nothing - aside from having heard of Orde Wingate! I picked up the above for £7.99 from a bookshop in the West End and I am very pleased I have. This type of campaign is ideal for the level of gaming I would like to undertake and this book is full of inspiration for doing so. The title features plentiful maps, troop strengths and accounts of battles etc which is of course the wargamers bread and butter when it comes to projects. 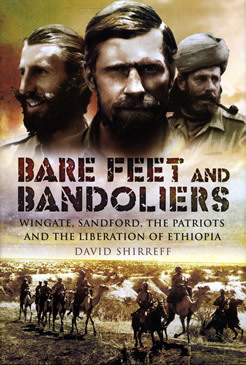 The object of the campaign was to reclaim Ethiopia from the Italians following their invasion in 1936 with the assistance of Orde Wingate and what became known as Gideon Force. I am not proposing to refight this campaign and so my interest is really one of how I can adapt some of the ideas for my own purposes. For similar reasons I would like to investigate the operations against the Vichy French and those that took place in Iraq - for which I already have a number of titles. I shall enjoy this and I suspect that at least one other gamer I know (if he hasn't done so already!) will do as well! It is now half way through February and I have yet to fight a game at home. Why is this? Simply put, I am currently at the mercy of waiting on things to materialise; coupled with the need to slightly reorganise the man cave to be more space efficient. The one thing that both of these factors have accorded me though, is time. Time to think, to plan and to really scratch beneath the surface of my wargaming wants. The naval dimension for sure will be the first priority and once the remainder of my Stonewall 1:2400th WW1 models arrive I can begin in earnest to work on the fleets. In reality I could make a start now but the collection is currently so lopsided it would achieve little other than to kill some time. Painting of any kind at the moment will be difficult as I am reluctant to start any whilst the man cave is in need of its reorganisation. I have some 20mm vehicles on order that will enable me to kick start the early WW2 kit once I have the requisite infantry bits and pieces in place but again, this is all in transit and anyway, I am still pondering the best way to utilise the forces raised - complicated by the fact that I should really be looking at the earlier period to tie in with the WW1 ships. These will be the key projects for me for this year and funny as it sounds at the moment I am not exactly busting a gut to get any of them underway in a practical sense. It is the Tonbridge show at the end of the month (to which I am going) and this will serve to fan the flames for at least one of my projects which should also coincide with some lounge furniture arriving. The lounge furniture affects the man cave indirectly as once this is in situ, a cupboard will be freed up from the kitchen which can in turn go into the loft (the location of the man cave). This, combined with some additional bits and pieces from Ikea will complete the aforementioned reorganisation and then it will be all systems go on the gaming and painting front - at least once it is finished. So my home wargaming at present is very much a waiting game but it is giving me the opportunity to think and to plan and so that is seldom time wasted. Most wargamers of a certain age grew up on a diet of 20mm Airfix figures and kits but for the most part moved away from the same as more 'sophisticated' scales became available - 25/28mm, 5mm and of course, 15mm. We all did it - I know I did - but some of us managed to maintain a connection with 20mm especially for WW2 although I know of gamers that regularly use 20mm ACW, Napoleonics, 18th century and even the English Civil War so the scale is most emphatically alive and well. I have been pondering over the last week/month/year (delete as applicable) about whether or not I should embrace 15mm or 20mm for my planned Fezian/Rusland adventures and I suppose that I probably no nearer making a decision than previously. However, stepping away from a problem and looking at it again with some fresh eyes certainly makes a difference. I started by looking at exactly how I am going to be fighting my games at home. This will be using Hexon terrain and for the most part on a 13 x 9 hex battlefield. A Hexon tile is 4" across the flat sides and so essentially what I am looking at is having figures/models that will look right within a single hex whilst preserving the illusion of relative weapon ranges etc. With this in mind I have come to the conclusion that 15mm is probably too small as one would need to use more models within a given area in order to look 'right'. For WW2 games then, 20mm will the way for me to go as a single hex will fit most vehicles or deployed guns and crews and as far as infantry are concerned, a fire team of 4 figures, individually based, would look well when suitably spread out around the hex. Earlier periods in 20mm would look better with more figures but given the overall size of the armies I am looking at this should not be too onerous especially if I opted to use even larger figures - say 28mm. In the meantime then, I have decided that for my 20th century games involving Fezia and Rusland I will be using 20mm as my preferred scale. I am really keen to tackle some kits again and working with the current crop of 'fast assembly' models from manufacturers such as Plastic Soldier Company, Armourfast, Pegasus Hobbies and others; coupled with the plethora of readily available plastic figures means that I can realise armies that I only used to dream about back in the early 1970s. There seems to be an awful lot of new kit around in plastic - and in 15mm. Even Flames of War have taken a leap into this medium with the new starter set for their WW2 rules. The above caught my eye simply because of the V1 - handily scaled at 15mm which means it would be usable with the Angels 20 aircraft I have - chasing down V1 makes for an interesting game as any Air Force player of yesteryear will testify - for something a little different on a club night. I was impressed with the plastic content of the above - 8 Shermans, 3 Stug 3s and a pair of PAK 40 anti tank guns not to mention US paratroopers and German grenadiers (complete with plenty of handheld anti tank weaponry) - and the obligatory rules and tables and plenty of dice. Very tempting at £45 I can tell you! The Plastic Soldier Company of course has a pretty good selection of 15mm WW2 kit and so mixing and matching would be a possibility - added to which are the models available from Zvezda. It would appear to be a good time to get into WW2 in 15mm then but the one thing I would love to see is someone tackling another period in this scale in plastic. I suspect that most wargamers of a certain age are familiar with the above documentary series first shown in the early 1970s. For the young and aspiring wargamer there was much in this series to inspire and inform and I devoured it avidly. A couple of years ago I received for Christmas the eleven disc digitally restored all singing, all dancing, bells and whistles version of the entire 26 episode series and promptly put it on the DVD shelf where it has sat ever since. Today, I decided to sit down and watch it from episode 1 (not all at once I hasten to add!). I am really glad I did. I had forgotten just how good this series was for the time. Miles of actual film footage from across the globe and interviews with many of the actual participants; together with that haunting theme music and the narration of Laurence Olivier made for compelling viewing and with the power to chill even now. Of course the history has been edited to fit the series and so the inevitable back up of a lot of reading would help to flesh out the 26 hours or so but then most wargamers would do that as a matter of course. Thought provoking and inspiring - even 40 years after it was first shown on TV. I would recommend this set to anyone with an interest in WW2 for the film footage alone. The book that accompanied the series by Mark Arnold Forster is not a bad read either and I understand that the late Richard Holmes also wrote a book revisiting the series from an oral perspective. Highlights thus far include The German navy bombarding Poland using the rebuilt Schleswig-Holstein battleship, French Tanks in action and also Finnish ski troops. Of course there is a lot of 'staged' footage but even so, it is well worth a look. More details can be found here - The World at War. My order from Stonewall is still being cast and so I thought I would post up some pictures of of what I have so far. These are the German ships from the collection although I am still waiting on some of the missing codes. The models are basic in respect of detail but as gaming pieces are ideal. To begin with there are no separate turrets unlike C in C and GHQ which is no bad thing in my opinion. Similarly there are no pole masts although this could easily be rectified if required. I have previously described these models as being like 1:3000th scale ships on steroids and I think that is probably as good a description as I can think of. The castings do need a little cleaning up - the capital ships have a noticeable mould line - but certainly nothing drastic with these - unlike the RN types currently being replaced. To be honest, these are cheap and cheerful models which will probably not suit the scale modeller but I defy you to get similar scaled models from anywhere else at the price! I am looking forward to tackling this lot and no mistake and so the rest of the collection can't come soon enough! As far as the detail of these models is concerned in respect of accuracy they are pretty close to what they should be unless you are a rivet counting purist - in which case I suggest you look away now! I have taken pictures of each of the models with their associated catalogue number and alongside a ruler so you can get an idea of the size. Apologies for not lining up the model with the edge of the ruler! As you can see then, these are pretty fair representations of what they should be and the apparent lack of scale model detail should not prove to be a handicap for what are in effect gaming pieces. I am really looking forward to organising the four fleets and am going to turn both the historical Royal Navy and High Seas Fleet into something based on their actual counterparts rather than just as they were. This will enable me to add in some personal touches and will be in keeping with the 'imagi-nation' basis for the fleet compositions. Yay!!! The lounge is finished! Sunday saw the ceiling painted, Monday and Tuesday the walls (two coats), Wednesday was the glossing of the woodwork and today was putting the house back into a semblance of order! On the plus side it has given me much time to think about for the man cave in terms of how it is going to be changed. A visit to Ikea will be needed and then a day to sort it out and it should then be fine and dandy. It has also given me the opportunity to think about my various plans etc for the gaming year ahead. On the gaming front I am still eagerly awaiting the arrival of my Stonewall 1:2400th WW1 collection and I have also been giving a lot of thought around the question of scale for my pending armies - more of which to follow in due course. HMS Agincourt as she became - after the Brazilians had sold her and the Turks 'lost' her. In Royal Navy service she lost the 'flying bridge' between the funnels before going on active service. Plans are afoot for the great 1/2400th WW1 naval-fest in which I shall be painting not one but four navies. An order has been sent to Stonewall Figures (together with the models for replacement) and moves are also afoot to acquire a few models from C in C (via those very nice chaps at Wargames Emporium) for collection at the Tonbridge show at the end of the month. The navies of Fezia and Rusland, for the 1910 to 1920 era, will be modelled on the Royal Navy and the High Seas Fleet in the early dreadnought years - say up until around 1914. I have deliberately limited the navies to 11" and 12" weapons for their dreadnoughts as this fits in rathe more readily with the fictional background. This means the Fezian will be using Bellerophons and some of the later 12" armes types whilst the Rulanders will be making use of Westfalens and Helgolands. I do have one rather special addition to the Fezian navy though. HMS Agincourt (ex Rio de Janeiro, ex Sultan Osman) has a number of unique features. Aside from the small matter of being the dreadnought battleship with the record for the number of main gun turrets (seven) she also boasted the largest wardroom in the fleet - an important consideration for the original owners, that is the Brazilian navy. Apparently they set great store by the provision of comfort for their officers - I seem to recall reading about this with a couple of monitors the RN took over in 1914 in which the officers quarters were described as palatial - lots of mahogany panels and plush fittings.HMS Agincourt saw service at Jutland and the sight of her firing full fourteen 12" gun salvoes was described, one imagine somewhat tongue in cheek - although with questionable taste, as looking 'like a battle cruiser blowing up!' At Churchill's insistence she was taken from the Turks (the crew had already arrived in England to take delivery) as having the possibility of her being used against her builders was not what a scenario he wanted to consider. Turkey was rightly miffed by this apparently high handed attitude and so moved further into the German camp - cemented of course when the Goeben and the Breslau were 'given' yo Turkey. In the 1914 edition of Jane's Fighting Ships HMS Agincourt appears in the section devoted to Turkey and so such a matter of historical record cannot lightly be set aside. I am acquiring a C in C version of the Agincourt for use as the Fezian fleet flagship. That should give the Rusland navy something to think about. One of the joys of being unemployed (and that was written with attempt at irony!) is that one has the opportunity to catch up on a number of DIY jobs around the house. These are all very necessary and comprise the inevitable maintenance and of course, decorating. Since my current bout of joblessness SWMBO and I have been busy and have completed the home office, my daughters bedroom, the en suite in the master bedroom and the downstairs cloakroom. Next week (actually starting today) will see the lounge being decorated - bear in in mind this is a double or through lounge - which is in effect tackling two rooms. This will mean that my blog will probably be silent for a few days as I grapple with ceilings, walls and woodwork - in that order - but I should be back on stream later in the week. I shall be answering emails and comments etc but nothing more exciting. The big plus of this endeavour though is that it has given me a number of ideas for the man cave - not so much for decorating - along the lines of reorganising the storage to be more space efficient. By doing so there will be more floor space so this is something that will receive some attention once the lounge has been finished. I have also gotten the order sent off to Stonewall Figures for the additional 1/2400th WW1 ships and the replacements for the old models I have will also be under way in due course so the end of the coming week will be an interesting one for sure!